Distant, quirky, maverick, lawless, and more--these descriptions of out-of-bounds planets (OOBs) and unaspected planets in the natal horoscopes of 2016 candidates Hillary Clinton and Donald Trump may be worth our consideration and now that Marc Penfield has revealed an accurate birth time for Hillary, let's make note of such planets and their conditions. The term unaspected planet can be misleading since minor aspects actually may be the case (see Trump's planets, below) though no major ones are formed, angular contacts may be apparent, midpoint pictures can involve such a planet, and/or an aspect may be exist yet be outside the allowed orb from the planet under consideration. (Midpoint pictures will be included in this assessment, below; Hillary's assessment comes later this week). With an unaspected planet, a one-pointedness is evident and an intensity revealed by the planets sign which expresses in its house, and by house rulership. Its energy in unmodulated by other planets and the unaspected planet expresses its energy in a purer form dictated by its sign (and in some cases, its degree, and whether or not it conjoins or opposes a fixed star, etc). The 'where' is of course, shown by house placement, and to some degree, by house rulership. (1) Unaspected planets are not silent in a person's character but intense, and may act with an 'on-off' spurt-like quality, or, in an 'all or nothing' manner, with no 'halfway measures allowed' (Dean). Transits and progressions are unnecessary for its influence is strong (though perhaps unconscious) without such triggering, and an outstanding, original quality may be given to the personality as a whole. Plus, a noticeable Uranian vibe may be evident, unfiltered through or by other facets of the personality as described by the rest of the planets (actors) in the chart. Unstable? Probably but an element of genius may also be part of the picture (again, similar to how quirky Uranus the Maverick can operate). Just as the unaspected planet doesn't 'join in' with the rest of the natal map, the person born under a planet in such a condition may be something of an ivory-tower type when it suits. (2) An OOBs planet denotes a condition where the planet is orbiting outside the earthly plane and though it may be in aspect with other planets, there is something distant, untouchable, or otherworldly about it. With its energy acting upon the Unconscious, we might say it is hidden from the native's conscious mind and acts in an uncontrolled way. A measure of secrecy and lawlessness may be involved in the planet's activities and this secrecy may 'rub off' on the planet/s it touches by aspect, if it is aspected. Now, since Mr. Trump is the older of the two candidates, let's consider first his unaspected (1) and OOBs planet/s (2) and the midpoint pictures they are involved in, if any; as noted, Mrs. Clinton's planets will be considered later this week as my schedule permits. (1) Out-of-Bounds Mercury @8Cancer51 in the 11th house of Groups and Associations; (1) unaspected Pluto @10Leo02 in 12th house of Politics and Karma. An OOBs Mercury denotes one whose mental development is unique and though curiosity is strong, the considerable amount of information that is gathered seldom includes what would lead to self-knowledge or understanding. The mind is intelligent and capable yet reasoning ability is 'out there' when it comes to analysis of the other facets of the character as described and informed by other planets. A single area of life stands out for Mr. Trump and that's Cancerian concerns such as business activities like real estate, and family matters. And of course, Cancer is ruled by the Moon so ladies are a focus along with Cancer's tribal tendencies toward nationalism, patriotism--and self-protection. 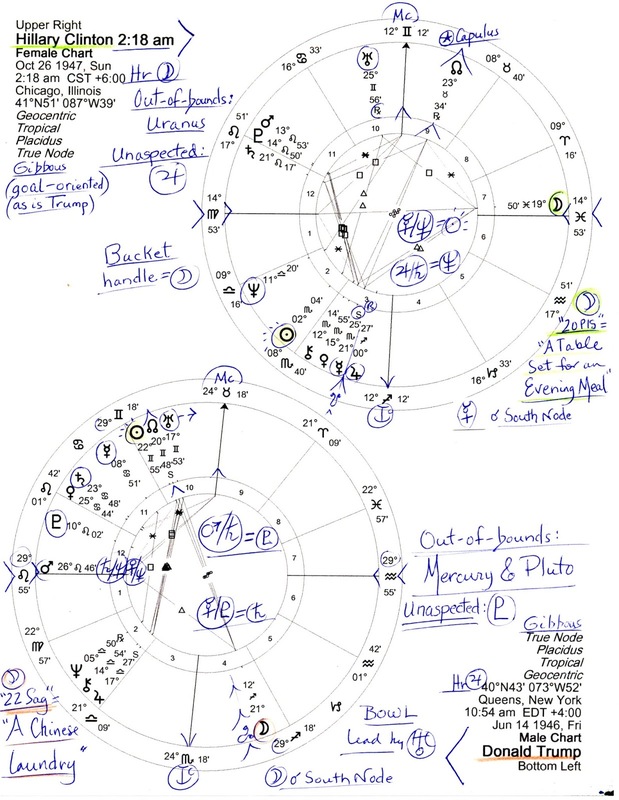 (Mr. Trump's Mercury is zodiacally in the midst of America's natal Venus-Jupiter-Sun in Cancer). During Campaign 2016, we've certainly noticed his off-the-cuff Mercurial ability to avoid blame and project 'the beam in his own eye' onto others as he slides sideways like a crab! Additionally, one word associated with an OOBs Mercury is hyperactive and as we know, Mr. Trump is awake at all hours of the night (we know because he tweets!) and is not inclined to weigh all sides of an issue before communicating. Logical, objective evaluation is not a talent with an OOBs Mercury, planet of mind and ideas, though brilliant insights are evident in the realms relating to Cancer. His staccato way of speaking in incomplete sentences is also denoted. His Mercury doesn't connect or inform his other natal planets which would benefit from the input but what we hear are unusual thoughts vividly expressed. 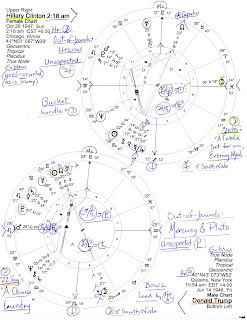 (1) Unaspected Pluto @10Leo02 in 12th house of the Unconscious suggests one who is 'overshadowed by shadows' (Tierney) with Pluto, the isolationist, being the planet of Psychology, Psychiatry, and persuasion. There are subterranean forces within his psyche that are totally fragmented from the rest of his personality and because they are buried, he is unaware of them which gives them even greater primal power. This, I believe, suggests the "he can't help himself" remarks that perhaps you've heard from commentators and reporters (exs: all-hours tweeting about former Miss America, Alicia Machado and her weight gain, and other crass behaviors and remarks that set him back in the polls). However, disturbingly for our country, an OOBs Pluto, archetypal god of the Underworld, may also indicate one who is a sociopath and/or a criminal, particularly in the Leonine realm of gold and finances. So perhaps there is more to the infrequent whispers of mafia ties than have so far been revealed. Certainly his oppressive business dealings are in the news via contractors and others who have worked for him but not not been paid, plus, the tax avoidance made possible by laws that favor the wealthy--legal, yes, but anti-societal and hypocritical of him. And the primal violence of Pluto has been part of his campaign--even to the point of hinting at Second Amendment gun violence as an antidote to certain problems via Pluto, the assassin, aided by aggressor Mars. Now for Mr. Trump, the natal midpoint pictures that involve his OOBs Mercury and his unaspected and OOBs Pluto are: 1. the difficult Mars-Saturn = Pluto which shows potentials for corruption, forcing an issue, a need to take control, fury, brutality, and/or strong anger. And there can be ruthlessness when pursuing sources of rumors, leaks, and other information (Mercury-Pluto = Saturn in Cancer). Yes, as a Sun Gemini he is quick-witted, a deal-maker and a talker, and he likes to tackle serious issues and has a talent for reading the motives and intentions of others (Sun-Saturn = Mercury). So let's close with a quick word about a minor aspect between Mr. Trump's Pluto and Sun which is an irritating semi-square (45 degrees) with health connotations. In his case, both Sun, Pluto, and the sign of Sun-ruled Leo hint at heart and vitality issues. Yes, Sun-Pluto is the power-craving duo but please pardon me for mentioning this, for what seems to be a chronic lack of sleep adds to such health concerns and does his heart no good, but the minor semi-square aspect isn't strong enough to moderate the above traits of his unaspected, out-of-bounds Pluto. However, if the minor aspect affects the situation at all, the square influence could add an amount of intolerable pressure, frustration, a lack of moderation, and an inability to listen to advice to the planetary mix the maverick that is Donald Trump. For balance, you may wish to check out the unaspected and out-of-bounds planets of Hillary Clinton. Note: the usual midpoint sources are recommended: Ebertin's The Combination of Stellar Influences, Munkasey's Midpoints: Unleashing the Power of the Planets, and Tyl's Solar Arcs.